How do Navy Seals lead and win? Jocko Willink and Leif Babin explain in their book, Extreme Ownership. The authors are former Navy SEALS and combat veterans. After multiple deployments to dangerous places like Ramadi, Iraq, they have valuable leadership principles to share. In Extreme Ownership they bridge lessons from the battlefield with challenges in the business world. The result is a leadership book accessible to both military and civilian leaders. Broken into three parts and twelve chapters, each chapter focuses on a core leadership principle. For example, Jocko’s first lesson about a friendly fire incident in Ramadi leads to a principle of accepting personal responsibility. In fact, this is the central lesson of the book. Leadership is about assuming personal responsibility for everything that takes place in an organization. Jocko hammers this point repeatedly. Taking ownership for problems is a leadership imperative. Furthermore, leaders should be quick to credit their subordinates for success. In order to “win the war within”, a leader needs to look inward and figure out what he or she should do to make the organization successful. For example, this may take the form of belief. When tasked with a seemingly insane mission- taking poorly trained Iraqi troops on missions- Jocko writes about taking ownership of it and trying to believe in the mission. He does this by putting himself in the shoes of his higher commanders. He looks several levels above his narrow field of view. In this case, the Navy Seals of Task Unit Bruiser did not want to conduct operations with Iraqi soldiers. Who could blame them? The Iraqis were poorly trained, ill-equipped, and lacked motivation. But, Jocko communicated to his team that if they took Iraqi soldiers with them, they would be authorized more missions. Furthermore, if they were able to train the Iraqis to defend their own country, the Navy SEALS would be able to set successful conditions for U.S. troops to leave the country for good. This simple logic was enough to get his team to believe, which they did. Laws of combat include decentralized command, prioritization and execution, and simplicity. With the example of simplicity, this lesson was magnified through the lens of a unit’s first patrol in Ramadi. In this case, the patrol unit leader, a young Lieutenant, had trained Iraqi soldiers for a patrol into enemy territory. After reviewing the Lieutenant’s plan, Jocko convinced the officer that the plan was too complex and underestimated the dangers on the battlefield. Reluctantly, the patrol leader took Jocko’s advice. The patrol took contact after 12 minutes outside friendly lines and sustained multiple casualties. Consequently, the patrol leader learned a hard lesson about simplicity. Jocko points out that the situation could have been much worse if not catastrophic had the Lieutenant gone with the original plan. Thus, the old adage- a plan breaks down on first contact- means that plans need to be simple to mitigate the inevitable chaos and confusion. The other saying, “the enemy gets a vote” means that leaders can’t anticipate everything that will happen when they step outside the wire. In the business world, complexity can create chaos too. For example, Jocko uses the example of a company with a confusing employee bonus plan. The intricacies of the system made sense to management. But, to the employees? Head scratching all around. But, how are problems like these mitigated? Understanding that “people take the path of least resistance” is important. People need to have simplicity embedded into the way they work. With simple plans, employees can be flexible when faced with challenges in dynamic workplace environments. Flexibility in operations will ultimately drive productivity. Employees will have clear expectations and a baseline upon which to effectively operate. In the final part, Jocko and Leif include some harrowing examples of close calls in Ramadi, Iraq. Specifically in the chapter on “uncertainty”, Leif relates a story of working with Chris Kyle, the famed Navy SEAL sniper and author of American Sniper. Leif tells of how Chris decided not to take a sniper shot until he got positive identification (P.I.D.) on a possible target. Leif was put in a position in which another unit of Army soldiers was pressuring him to take out the possible enemy sniper. Ultimately, Leif decided not to let Chris take the shot. The decision proved prescient when the potential target turned out to be an American soldier. Leif explains how this incident “scared the hell out of him.” If Leif had ordered the shot, it would have meant the end of his career. The lesson is clear. Leaders need to be decisive even in the midst of uncertainty. Logic must trump emotion. In this case, the emotion was tied to soldiers, who had been taking fire from enemy snipers. Leif had to resist the emotion of a unit that desperately wanted to kill the enemy. The military tries to empower its leaders to employ logic through training, doctrine, standard operating procedures (SOPs) as well as simple, executable plans. In business, chaos abounds too. Perhaps no better example of this exists than in the stock market. No one can predict the direction of stocks on a given day. One must have a disciplined and well-thought out investment strategy. This strategy can be simple too. For example, an investor can buy index funds and hold them long-term. With this type of strategy, investors can maintain confidence in the face of market uncertainty. Extreme Ownership is an extremely valuable book for leaders at all levels. I wish I had read this book a long time ago. It quickly became a call to action for me in my current leadership role. I found myself taking the leadership lessons and immediately figuring out ways to apply them. 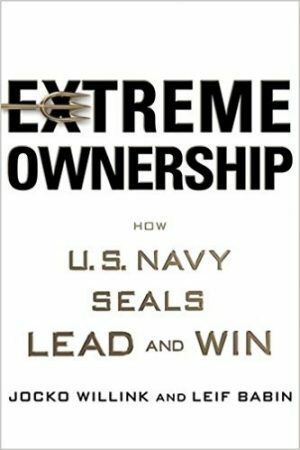 Finally, Extreme Ownership is a great book to read with a team or organization. The book provides a strong platform for productive conversations. Team members and leaders will benefit from each principle as they are simple, timeless, and supported through tough experience. As leaders, we are called to learn from what others have gone through. With Extreme Ownership, Jocko and Leif are exceptional teachers.